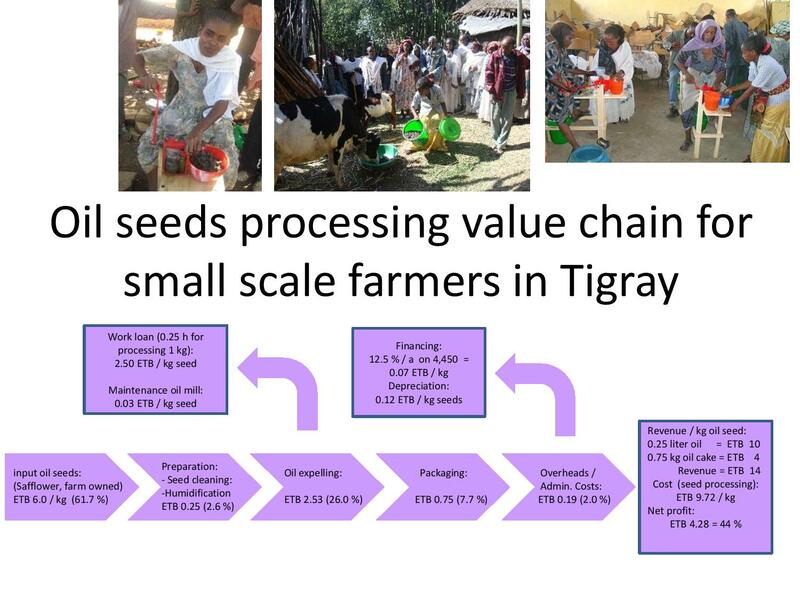 The Sustainable Land Management Program (GIZ SLMP) began in 2012 the promotion of small scale oil seeds processing in Tigray. The Tigray Agricultural Marketing Promotion Agency (TAMPA) started a collaboration with GIZ SLMP in 2013 for the promotion in Western, North Western and Central Zone of Tigray. The target groups are oil seeds producing farmers organized in user groups. Actually, about 30 user groups (=300 households) were provided with one processing unit (manually operated oil expeller) for each group in the following 13 Woredas in Tigray:Raya Azebo, Enda Mehoni, Alaje, Kola Tembien, Tahtay Koraro, Tahtay Maichew, Medebay Zana, Laeley Adiabo, Kafta Humera, Wolkait, Tsegede, Alamata and Ofla. The project enhances oil seed farmers to add value on their raw products. The final product is a healthy virgin oil from Noug (Niger Seed) or Suff (Safflower) which will improve nutrition of the farmer families and generate income. The by-product is oil cake which serves as protein concentrate for animal feed. This page was last modified on 12 December 2014, at 14:59.